On a high windy hill overlooking the site of a once rough and rowdy trail town called Arland, Wyoming, whose only caretaker is the lofty peaks of the Absaroka Mountains, lies the lonely grave of a woman, mute testimony to a time long past. Residing in this grave are the bones of Belle Drewry, a "lady of the evening" whose life ended in a gunsmoke filled saloon in 1897. 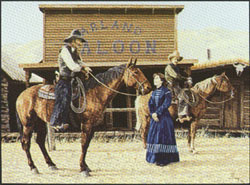 A mere three years previous in 1894, this woman found herself embroiled in an "eternal triangle" which ended with the shooting deaths of two local cowboys, Williams Gallager and William "Blind Bill" Hollihan, and the imprisonment of a third man, Bill Wheaton, who, upon his release from the Wyoming Penitentiary in 1898, returned to Arland and learned that Belle Drewry had been killed the year before by a vengeful cowboy after she shot and killed Jesse Conway at a saloon party. On her grave was placed a headboard and on it the strange epitaph "The Woman in Blue With Heart So True".